If you are America’s largest online retailer, you don’t have to offer coupons or cash back deals to get people to buy from your web store. But if you are an Amazon customer, there are still ways to maximize the savings you get when making purchases on Amazon.com. First, there’s Amazon Prime, which, for $79 offers 2-day shipping for an entire year on “millions of items” sold on Amazon, and, in my experience, almost all items shipped by Amazon itself. Students can get one year of Amazon Prime for free, and pay only $39 per year subsequently. If you shop a lot online, or are in the market for some bulky item with a high shipping charge, Amazon Prime may be a good deal. But to get the most out of your Amazon purchases, look into double-dipping. Since August 2011, Hawaiian Airlines’ eMarket has been giving miles, now downgraded to 1 mile per dollar, for purchases made on Amazon.com. US Airways briefly also offered this deal, but has since pulled it down, making the eMarket currently the only portal worth a visit before an Amazon purchase. To double-dip, take a peek in your wallet. This quarter, from January 1st to March 31st, 2012, Chase Freedom cardholders get 5% cash back on up to $1500 spent on gas and Amazon.com. Unless you spend over $100 on gas every week, the $1500 ceiling should be enough to let you effectively get up to 5% in savings when shopping on Amazon until the end of March. If you don’t have the Chase Freedom card, the Citi Forward card may do the trick as well. Currently, the Citi Forward card, which gives 5 points per dollar on restaurants, books, music, and movies, seems to categorize purchases made on Amazon.com as “books,” effectively yielding 5% cash back when buying through the online retailer. However, unlike Chase Freedom’s deal, which explicitly includes Amazon.com in its 5% cash back category, Citi Forward does not offer a list of retailers eligible for earning 5 points per dollar. In other words, it’s a very sweet deal right now, but you should keep an eye on your statements since Citi can decide at any time that what you’re buying on Amazon doesn’t really count as a book. On the other hand, if you’re looking to use points and save on cash when buying on Amazon, check your Discover balance instead. In October 2011, Discover announced a new redemption option for its cash back program: spend it on Amazon. The dollars are spent 1-to-1, but while statement credits and direct deposits can only be redeemed in increments of $50, the “pay with Cashback Bonus” option for Amazon allows Discover cardholders to redeem any amount of cash back on an Amazon purchase, which means you don’t have to wait as long to transform the cash back you earned into real cash. 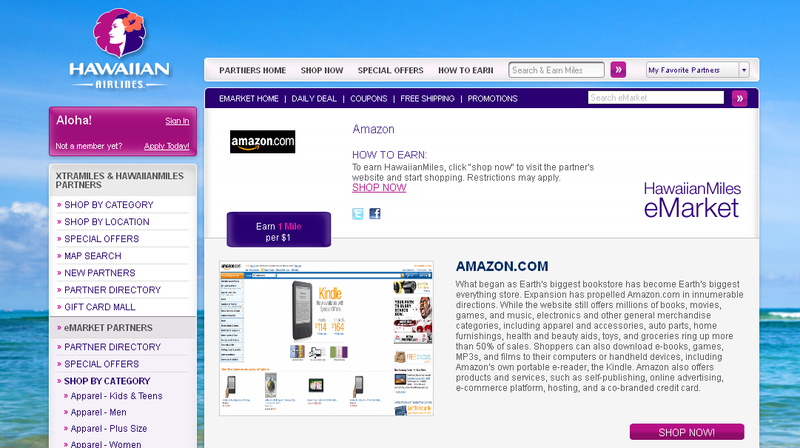 For this, all you have to do is link your Discover and Amazon accounts here. But whether you use the Chase Freedom or Citi Forward card to earn more points, or Discover to redeem points, don’t forget to go through Hawaiian’s eMarket. Even though Amazon’s prices are often already a good deal, and there aren’t many coupons to be found, double-dipping can still maximize what you get out of your Amazon.com purchase. New Year’s is just around the corner, and it looks like I’ll get to celebrate fulfilling one of my 2011 resolutions: pay off one of my graduate school student loans! In three years, I chipped away a $15,550 student loan balance, which now stands at just over $200. I’ll use some Christmas money to finish it off, and should ring in the New Year with one less student loan to deal with (but 2 smaller ones to go). Besides making payments on the loan during deferment, I used two shopping tools to help me work on that loan: UPromise and ThankYou points. I’ve covered the UPromise program before, but to summarize, it’s primarily based on a shopping portal that gives cash back to users. The cash back balance can then be applied against a Sallie Mae student loan account, transferred to a 529 education savings account, or redeemed for cash. The cash back rate is often not as high as that from Discover’s ShopDiscover or Chase’s Ultimate Rewards Mall, but every so often I come across retailers that are not partners with either of these two but are in the UPromise portal. Not that credit cards don’t help with student loans. Over the last two years, Citi’s ThankYou points program has been vital to erasing my student loan balance. I have the CitiForward credit card, which offers 5 Thank You points per dollar spent on books, movies, music, and, most importantly, restaurants, and 1 point on everything else. These points can then be redeemed for gift cards and cash, but also cheques to pay student loan or mortgage balances! Until September 2011, to get a $100 cheque, you needed 12,700 points, but since then the requirement has dropped to 10,000 points. There was no official announcement about this change, so I don’t know how long it will last – if you’re sitting on any ThankYou points and have a student loan or a mortgage, now might be the best time to redeem them. Now, 12,500 ThankYou points trade for $125 in Student Loan Rebates. In April, 12,700 points were required for $100. Admittedly, at 10,000 points for $100, this is the same redemption rate as for, say, a Banana Republic or a Macy’s gift card. However, I’ve found that it’s a lot easier to spend money shopping than it is to put money aside to pay off my student loan more quickly, so I prefer redeeming ThankYou points for student loan payments since it’s a way to force myself to pay down the loan with money that never made it to my hands in the first place. Besides, the redemption rate for student loans and mortgage payments is much better than for cash: $100 in cash costs 16,000 ThankYou points. To redeem ThankYou points for student loan or mortgage payments, all you have to do is call the ThankYou network (1800-THANKYOU) and give them your lending company’s name. They will then mail you the cheque, which you can send to your lending institution along with a note with any special instructions on how to apply the payment (e.g., post everything to the loan with the highest interest rate or to the one with the smallest balance). For UPromise, even though the payments post automatically, you can also call Sallie Mae to request a change to how any payment is applied. With less than two weeks of 2011 left, if you are also aiming to making a big chip on your student loan or mortgage balance, now might be a great time to ramp up the online purchases you make through UPromise or to redeem your ThankYou points for loan payments. The fact that now you only need 10,000 ThankYou points for a $100 cheque not only sweetens the deal but may also be the push you need – it’s not clear how long this new rate will stick around. And if it’s too late for 2011, here’s an easy 2012 resolution for you: set up and remember to use UPromise or the ThankYou network to get rid of your student loans next year. Good luck, and have fun watching your loan balance disappear! This is Money Under Your Futon’s 101st post! To celebrate this occasion and thank our readers, we are announcing our new e-mail address: moneyunderyourfuton [at] gmail [dot] com. Please feel free to send us your money-related questions, and we will try to respond to them in future posts. It is hard to make money off your checking account. With a few exceptions, such as ING’s interest-paying Electric Orange account, most checking accounts give you no more cash than what you have already deposited into them. And some don’t even offer that, as their maintenance fees slowly chisel through your balance. But sometimes a bank promotion can transform a regular checking account into part of a relatively generous program. With Citibank, for example, you can earn ThankYou points every month simply for having a checking account with a debit card and direct deposit. The ThankYou Network allows for point accumulation through several services and merchants, including Citibank and Expedia, though the fastest way to earn points is usually through one of Citibank’s credit cards tied to the program. But Citibank also gives its checking customers monthly ThankYou points for coupling the account with at least any two other services, such as having a debit card, direct deposit, or online bill payment. The monthly points range from 25 to 1,200, depending on the type of checking account and the number of services linked to it (click here for a table detailing the points per account type and number of services). You can earn even more ThankYou points if you use your Citibank debit card for purchases. Although the credit card offers tends to be more generous, Citibank has jumped into the bank trend of linking debit cards to reward programs in an attempt to attract more customers dropping credit cards in response to the crisis. For purchases made with a Citibank debit card, you can earn 1 ThankYou point for every $2 spent on signature purchases (i.e., a purchase that requires your signature on the receipt) and 1 point for every $3 on purchases using your PIN. If you already have a ThankYou Network account, make sure to get points for your checking and debit card use. Call customer service (1800-THANKYOU) to link your checking account to the network. And if you have a Citibank checking account but are still not in the ThankYou Network, consider joining it and reaping rewards, especially if you use the other partners in the network, have a high-end account for which you can get a lot of points per month, or use your Citibank debit card frequently. With the current low interest rates on savings account, you may find that your checking account gives you more bang for your buck. Citi Forward Visa – As mentioned in a post a few weeks ago, I got this card to replace my corporate credit card, which I have been using as my primary credit card for the past three years (more on this in a later post). There is no annual fee and you get rewards for being a responsible cardholder, such as 100 ThankYou points each month and a 0.25% APR reduction every 3 months for staying under your credit limit and paying on time (These are things I have always done, and yet have never been rewarded for them before. But your APR can only be reduced by up to 2%.). Further, I get 5 ThankYou points for each $1 spent on books, music, movies, and restaurants. These purchases make up the bulk of my spending anyway! For all other purchases, I get 1 point for each $1 spent. Last, I love Citi’s ThankYou Network rewards program, as I have already discussed in a previous post. Discover More Credit Card – I also use this as my secondary credit card for the reasons mentioned in Part I. Another reason I love this credit card is the fact that I can order multiple cards for the same account, including one that can be put in my keyring. Discover offers a variety of card designs, so you can choose the one (or several) to reflect your personality and to put them in different wallets. Plus, the Discover card is the only card for which I have gotten compliments from waitresses and cashiers. I can also purchase from retailers through ShopDiscover and get 5% cash back that way. Let us know which credit cards are in your wallet and how they have worked for you. I recently applied for the new Citi FORWARD Visa Card, because I will resign from my company in a few months and be forced to relinquish my corporate Diner’s Club MasterCard. The Citi FORWARD is a pretty neat credit card and I will go into more details at a later post. For now, however, I would like to talk about the Thank You Network, which I recently discovered and which serves as the rewards program for all Citi-affiliated credit cards, financial products and services. Use a Citi credit card, such as the Citi FORWARD. Link your Citibank account to your Thank You account. If you have a Citibank account (either the Access or Basic Checking), an ATM card, and a direct deposit set up, this will earn you 25 points each month. Think about it – you don’t have to make a single purchase and you still earn 25 points each month. AND if you do use your ATM card, you get a point for every $2 you spend on purchases with your signature (meaning you click “Credit” at the machine and sign your name) and for every $3 you spend with your pin (meaning you click “Debit” and enter your pin number). Make purchases through retailers at the Thank You Bonus Center and earn bonus points. For example, currently you can earn 3 points for every dollar you spend at iTunes. Book hotels, cruises, and vacation packages through Expedia. Of course, you should only do so if you were to come across a good deal. You can also earn points on flights if you book a hotel stay at the same time. In this scenario, you would earn frequent flier miles for the flight and Thank You points for both the flight and hotel. And I am not even done. Once you are ready to redeem your points, the Thank You Network’s reward collection is akin to an Amazon store. You can redeem points for books, DVDs, music, and electronics, etc. There is even a sale section, where you can get items at a discounted number of points. In addition, you can also trade your points for a student loan rebate to pay for your student loans. A $25 rebate will set you back 3,300 points. Obviously, I am not advocating that everyone switch to/set up a Citibank account or sign up for a Citi card; I was simply struck by how quickly and easy I can earn points through the Network and the many rewards options I have to redeem my points. If you just graduated and are still wondering which checking account to get and/or for which credit card to apply, I think the Thank You Network presents a pretty compelling case to become a Citi customer.